Some of us have problems in Windows 10 and we want to reset windows to solve them. 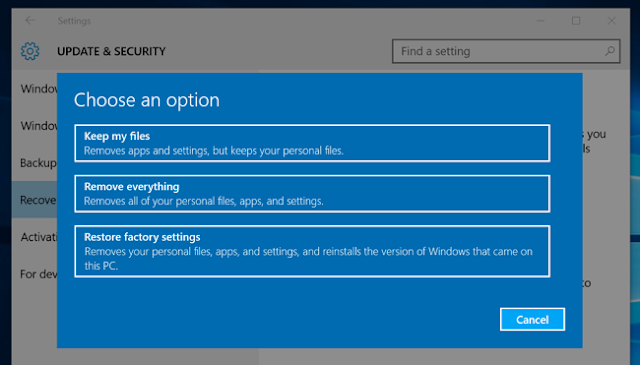 So i will tell you about a feature of windows 10 through which we can Reset windows 10 easily. We have two options, First reset it while keeping our files save, Second Full Reset and clean all hard drives. So its up to you now which option you want to choose. Almost all steps are same only changes in last steps. 1. Click lower left Start button on desktop to open Start Menu. Then Select Settings. 2. Under Settings click on Update and Security. After this Click on Recovery tab. 3.Click on Get Started button under Reset this PC Area. 4. Then you will get 3 Options, Click on Remove Everything. 5. Now you will get bit more options like Just remove My files or Clean the drive. Its depends on you which option you want to choose. Clean drive option is like install windows with ISO image. 6. You will receive a Warning message on screen Click Next. 7. After step 6 you will get a screen in which you will see Resetting will remove following things. Note: If you think you choose wrong option then you can go back and make changes. But Step 7 is last Chance after step 7 you cant go back and save files which you don't want to remove. After Clicking Reset your PC will restart several times. It may take some minute to reinstall windows 10. 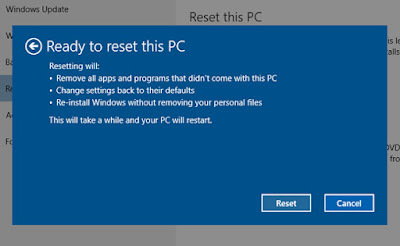 By following the steps given above your Windows 10 will be reset in few minutes.